The iconic Burgundian house of William Fevre is now producing top quality wine in Chile. 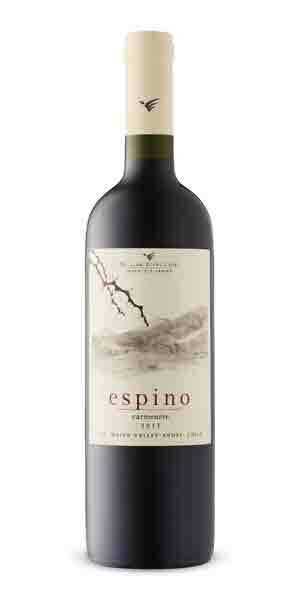 The Espino range of wines are made more naturally and capture the balance between pure fruit expression and the richness acquired by aging in barrel. The vines grow in San Luis de Pirque in light and permeable soils with great drainage owing to the presence of ancient tributaries of the Rio Clarillo. With managed yields of 2.25 kilos per plant and natural growing techniques, a high fruit quality was achieved required. The grapes were cold soaked for four days for colour, flavour and gentle tannic extraction with post fermentation maceration lasting between 5 to ten days which creates a richer textured wine with suppler tannins. After malolactic fermentation, the wine is aged in barrel for 8 months, followed by 6 in bottle before release. A little bit of Cabernet Sauvignon is added to the blend which lends more structure to the Carmenere. Deep cherry colour, black pepper, blackberry, plum, with notes of smoke and toffee. The palate is juicy and fresh with present by refined tannins. Great Carmenère textural plushness, spice and length.